Yesterday I was cooking dinner; well . . . sort of. Actually, I had a hamburger patty in a frying pan on the burner but was working on my computer. Suddenly my fire alarm went off. That really got my attention. The alarm was quite close to me – not good for my ears, but good for getting my attention, which was the purpose, after all. So I removed the now-crispy patty from the burner and grabbed a towel. A few minutes of waving the towel around the alarm finally ‘extinguished’ the alarm. What a relief. 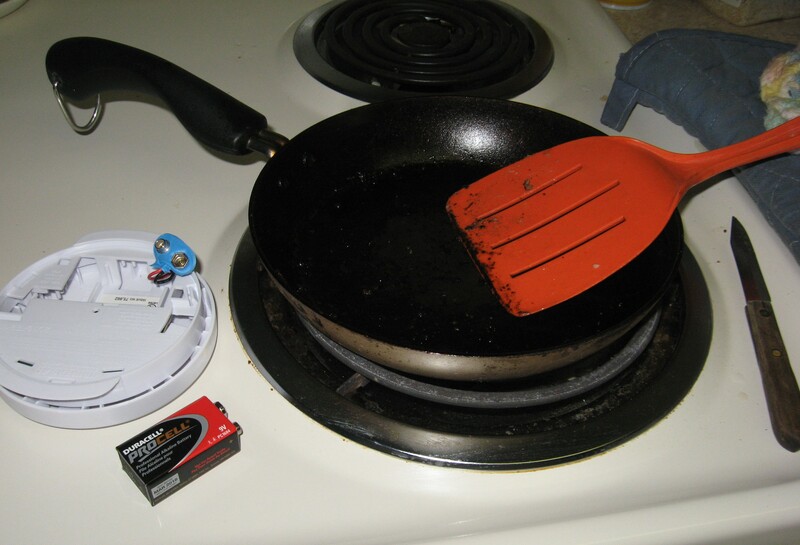 I went to the stove to salvage the remains, when an alarm went off again. But I realized it was the hall alarm this time. My efforts waving the towel didn’t work. So I disconnected the thing from the ceiling, took it to the bedroom and buried it under the pillow and some heavy objects. That dimmed the din, but didn’t make stop it. Finally I took it from under the pillow and removed the batteries. That worked. Just to make sure we don’t miss the message, the phrase “Today, if you hear his voice, do not harden your hearts” is repeated two more times, in Hebrews 3:15 and 4:7. What does it mean to harden your heart? Read the Book of Exodus. The repeated failure of the Israelites to trust in God and their continued disobedience is incredible. After all, these people saw the miracles of the 10 plagues in Egypt and crossed the Red Sea on dry land. Then God gave them the 10 commandments, and provided manna, quail and water. They still didn’t get the message. Unfortunately, too often I am like the ancient Israelites. I forget about all the marvelous things God has done for me and am diverted by my daily activities and pastimes. I grumble and complain. I get too absorbed in things. So I need a wake up call, or fire alarm, to get my attention. God knows our hearts, so one of the ministries of His Holy Spirit is to guide us in the proper direction, warn us when we start to stray, convict us of our sin and call us back to repentance and relationship with Himself. God also gave us each other. Followers of Jesus are called to encourage one another. That duty does not just entail a spiritual pat on the back, but sometimes a kick in the pants when we start to stray off the path. Of course, we can just ignore the alarms and harden our hearts. The ancient Israelites did that, so they had to wander in the desert for 40 years and never got to see the Promises Land. Not the best option. When the alarm bells go off, don’t ignore them, but heed the warning. I’m assuming Brits do not have fire alarms, given that they would have considered your burger underdone. And any vegetable that hasn’t been reduced to puree from over-cooking is underdone. Awesome example. I love that you found the lesson in this–fun and foundational. When I lived in Scotland in 1982-4 they didn’t have fire alarms, but probably do now. I must admit that I enjoyed my neeps and tatties (mashed potatoes and parsnips – favorite Scottish foods) last week. And they do have to be soft enough to mash. Besides, I’m about half British (the rest is French, Irish, probably some Scots-Irish, Native American, Jewish, and who knows what else. My mitochondrial DNA is from Africa).. Enjoyed reading this one, Lynn. I could just imagine you trying to bury the alarm! Would love to have a DVD of that scene. Thanks for the reminder about responding to God’s wake-up alarms. Great example. Are You a Dog-Person or a Cat-Person?